You may have noticed that many of our recent promotions have been for Soft-Lite® Windows. It’s not because we have a bunch in stock and need to clear our inventory, because we custom measure for every replacement window our customers order. It’s because this is the company that we know provides high quality windows, backs their warranties (on the rare occasion they’re needed), and that look great. We know that’s a lot of window speak. Our goal is to make the sometimes-confusing process of buying replacement windows less confusing. So, we’ll summarize by saying that when you choose Soft-Lite replacement windows, you’ll get a quality window that will look great, last a long time and provide you with significant energy savings over older single pane windows. If you think Soft-Lite replacement windows might be the right ones for your home, don’t wait to call Blair Windows & Doors. 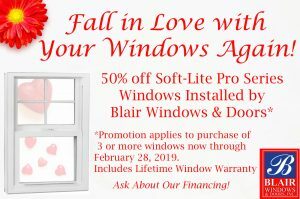 For the month of February, we’re offing a 50% discount on all double hung Soft-Lite Pro™ series windows when you buy three or more! Call or fill out our contact form to schedule your free estimate today – 317-356-4666.